A tree falling on your property is the last thing you want, but unfortunately, it is something that can happen at any time, especially during a storm. So what do you do when a tree falls? Your main priority in this situation is to look for signs of danger and rectify them. Are there any branches that could snap and fall further? Are there any tripping hazards? Head bumping hazards? If someone steps on a branch on the ground, could it cause another branch to swing around and hit them? Once you have taken measures to remove hazards, then you can begin the process of cleaning the tree up itself. Once the initial danger has been cleared to the best of your ability, then it is up to you to decide whether you can clear the tree away yourself or if you need a professional tree service to do it for you. 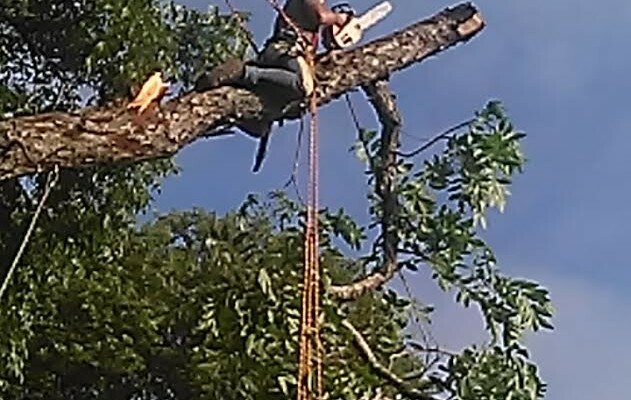 If it is a huge tree that has fallen, you’ll most definitely need a tree cutting and tree trimming service to remove it. If the tree is smaller, then it is up to you to decide, but usually, it is safer to get an arborist to come in and do it. A certified arborist will have a great deal of experience and will operate using safety procedures to ensure that no additional damage is done to your property and that no one is harmed. They can help with tree stump removal, tree removal, and tree trimming of other trees too. Regardless of whether you bring professionals in or not, it’s usually a good idea to see if there is anything you can remove yourself before they arrive. Remove any small branches that have broken off and are scattered around your yard. Saw off any excess branches that are easy to remove. Rake up all the leaves around the area. Just be careful—large fallen trees can shift or fall more, so you need to use extreme caution when near them. If the tree is big and has done a fair amount of damage, you will need to call some tree removal professionals to take care of it. Tree removal professionals have the right qualifications and equipment to remove even the largest of trees from your home, and they follow strict safety standards. They can also help with roof cleaning, stump removal, and stump grinding. Many also offer you a 24-hour tree service in case of emergency. At Tommy’s Tree Service, we offer you a high-quality tree removal and tree stump removal service. We are a certified arborist, and we can perform a range of other tree care tasks as well, such as tree trimming, tree pruning, storm cleanup, and more. We are a tree service company who can offer you the best tree care in the area. Call us today if you need an arborist service for your business or home.